The Small and Medium-Sized Enterprises (SMEs) play a crucial part in county’s economic growth and a key contributor in country’s GDP. SMEs play a relatively important role in emerging countries. They provide employment and one of the important sources for income generation. The main aim for the research is to examine the relationship between Intellectual capital, Environmental Turbulence and Performance of SMEs in Pakistan. A sample of 350 textile SMEs from 27250 was selected from Pakistan. Simple random sampling technique was applied. 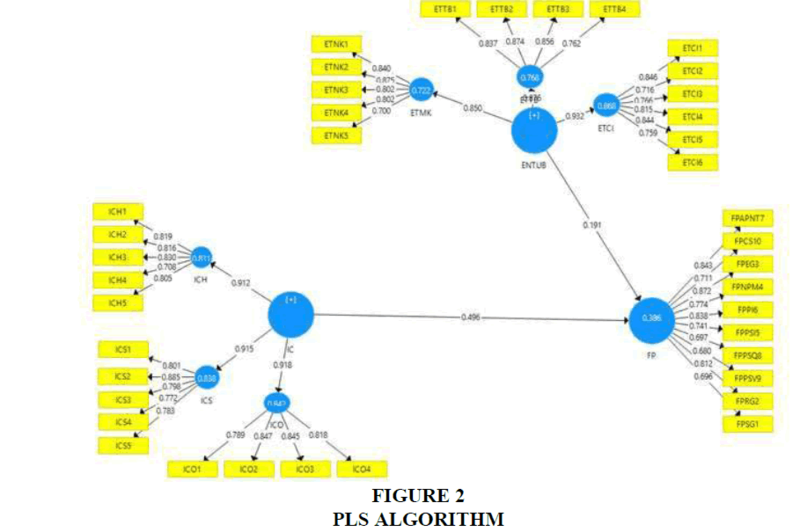 Statistical techniques such as SPSS and Smart-PLS was applied for analysis The results revealed that Intellectual capital influence the performance of SMEs and Environmental turbulence positively moderates the relationship between intellectual capital and performance of textiles SMEs in the context of Pakistan. Intellectual Capital, Environmental Turbulence and Performance of SMEs. The Small and Medium-Sized Enterprises (SMEs) play a crucial part in county’s economic growth and a key contributor in country’s GDP. In the emerging economies, SMEs are the major contributor to the national economic development and also a major source of the employment generation (Dundon and Wilkinson, 2018; Hughes et al., 2017; Irfan et al., 2014). In the developing nation’s cases, the role of SMEs is further magnified and boosted because the development of the county is not only built on the shoulder of Multinational Enterprises (MNEs). Since in the nation’s economic growth, importance of SMEs is widely acknowledged and there is a substantial amount of literature developing models which depict the pattern of SME growth (Chiang, 2018; Nijssen et al., 2006; Yasuda, 2005). The more literature is centred on the regions like Canada, Latin America, South Africa, Caribbean, the Europe and the Pacific (Federico et al., 2012; Gill and Biger, 2012). Eventually, few studies have focused on SMEs from South East Asia region, which include the countries like China, India, and Pakistan (Bilal et al., 2016). In the knowledge-based economy, intellectual, capital is seemed as the, critical success factor for the firms (Khalique et al., 2018; Khalique et al., 2011). Intellectual Capital (IC) is the main resource for the successful performance of the firm; however still less attention is given to this variable in studies related to the developing countries context and more exactly for SMEs. In Pakistan, there are few studies to identify the impact of intellectual capital-firm performance (Khalique et al., 2015; Khalique Isa et al., 2011). SMEs in Pakistan are facing lack of skilled and experienced workers. It is the main reason for their underperformed and business failures. In Pakistan, SMEs also need to build up the concept and practical implication of intellectual capital to their organizations so that they can attain the market-based competitive edge. In Pakistan turbulent environment is the main hurdle that hindering the performance of the firms and prevent them from taking advantage of opportunities (Harram and Fozia, 2015). Due to this, SMEs of Pakistan are not performing well and faces many challenges. Which result in continuous variability in cost/price, customers’ demands/preferences and structure of competitors? Hence the objective of this research paper is to identify the effect of intellectual capital and environmental turbulence on SMEs performance in the context of Pakistan and also examine the moderating effect of environmental turbulence between Intellectual capital and SMEs performance. John Kenneth Galbraith, in 1969 has been first conceptualized the terminology “Intellectual Capital” (Bontis, 1998; Edvinsson and Sullivan, 1996; Huang and Wu, 2010; Hsu and Wang, 2012). He supposed that intellectual capital is beyond real intellect but somewhat combined in intellectual action. After that, intellectual capital has come to be a wider research subject matter because of growth of the new economy which is centred on knowledge and information (Petty and Guthrie, 2000). “A set of intangibles assets encompassing competencies, resources and capabilities that surge firm performance and generate company’s value is viewed as intellectual capital” (Roos and Roos, 1997). Youndt and Snell 2004 stated that “the use, development and performance influence of intellectual capital have augmented significantly over the years.” Roos and Roos (1997) stressed that Intellectual capital is the important element for firm sustainable effectiveness, and a critical resource. Drucker (1999) and Huang and Wu (2010) stated that now a days the world is transforming from a production-based economy to a knowledge-based economy, so intellectual capital is a crucial element for the organizational success. Khalique et al. (2018) opinion out that the “ideas are transforming into final outcome (products and services) in knowledge-based economy.” Huang and Wu (2010), debated that intellectual capital be known to contribute to the progression of SMEs. Many researchers conceptualized the environmental turbulence and investigated its effect on organizational (Arnaout and Esposito, 2018; Kipley and Lewis, 2009; Meier and Toole, 2011; Ansoff, 2007). The first person is Ansoff in 1987 conceptualized environmental turbulence in depth, which was latterly named as Ansoffian strategic success paradigm. The impact of environmental turbulence on business performance is first identifying by An off, so he is one of the pioneer researcher who conducted investigation regarding environmental turbulence. The general view in this research stream is that businesses must evaluate the turbulence of the environment in which they are operating and counterpart their capabilities, aggressiveness and responsiveness to the environmental turbulence (Tiong et al., 2017). Boyne and Meier (2009) term environmental turbulence “as an unpredictable change in the munificence (such as available economic resources) and complexity (such as characteristics of organization’s clients) of an organization’s environment”. These turbulent variations challenge the organization’s essential stability, and subsequently will negatively affect organizational performance (Meier and Toole, 2011; Toole and Meier, 1999). The elements of the environment are integrally dynamic, which may turn the environment unstable. Environmental stability prompts organizations to advance fixed routines’ sets for managing with environmental elements (Aldrich, 1979). As Delgado‐Verde (2011) stressed that for existence of a firm, the main determinants is knowledge. This factor drives the interest of scholars to study intellectual capital and firm performance (Radulovich et al., 2018; Hsu and Wang, 2012; Scafarto et al., 2016; Sumedrea, 2013; Tsakalerou, 2015; Tsao and Hung, 2014). Previous studies conducted by Jo and Lee (1996), Sambasivan et al. (2009) and Littunen and Niittykangas (2010) revealed a positive significant relationship between knowledge of entrepreneur and firm performance. However prior to archival evidence, some inconsistencies related to intellectual capital on firm performance relationship also exist. The inconsistency refers to the conflicting results in the relationship between both constructs (Lee and Mohammed, 2014; Ozkan et al., 2016). Some studies debated that there is insignificance relationship between intellectual capital and firm performance (Gho, 2005; Barathi Kamath, 2007; Lee and Mohammed, 2014; Ozkan et al., 2016). H1: Intellectual capital has a significant effect on performance of SMEs. RBV form the intangible point of view, the fundamental focus of intangibility is toward resources such as innovation capability and intellectual capital employed so that has a competitive advantage in the environment (Mills et al., 2003). Organizations using such resources are at advantage of using internal competence with a view of acquiring the necessary strength and capabilities in implementing the formulated strategy for them to achieve their fundamental goals. The impact of such strategies is seen through organizational ability in gaining competitive advantage and meanwhile remaining relevant in the dynamic environment. Many authors link one or more of the intellectual capital components to a sustainable competitive advantage (Bogner et al., 1999; Chaharbaghi and Lynch, 1999; Jardon and Susana Martos, 2012; Huang and Kung, 2011). Cheng et al. (2010) and Kamukama (2013) argued that in today's global and ever-changing environment, intellectual capital is increasingly substituting for tangible resources as a major source of firm's competitive edge. Many researchers have debated that, intellectual capital is one of the main element for the SMEs’ success and that it is indistinguishable connected to their performance (Crema and Verbano, 2014; Emmanuel et al., 2016; Khalique et al., 2015; Ridhuan, 2015; Shumaila and Afza, 2014; Ullah et al., 2015). The scholastic debate with regards to intellectual capitalperformance relationship has yielded contradictory results and mixed findings (Asiaei and Jusoh, 2015; Crema and Verbano, 2014; Lee and Mohammed, 2014; Ozkan et al., 2016). Some empirical studies disclose that there is no effect of intellectual capital on firm performance (Gho, 2005; Kamath, 2007; Lee and Mohammed, 2014; Ozkan et al., 2016). As aforementioned, due to the inconsistencies and mixed findings, previous studies assert that the association among intellectual capital and performance should be moderated (Bemby et al., 2015; Juma and McGee, 2006; Castro et al., 2013; Scafarto et al., 2016; Tarus and Sitienei, 2015). Past studies indicate that a number of factors can moderate and facilitate the intellectual capital-performance linkage (Hakiki and Ferdianti, 2015). Some researchers emphasized the importance of environmental turbulence to facilitate intellectual capital-performance relationship in SMEs (Pratono and Mahmood, 2014; Juma and McGee, 2006). Thus indicating environmental turbulence as a potential moderator. H2: Environmental Turbulence moderates the relationship between Intellectual capital and performance of SMEs. On the basis of literature discussed above, the theoretical framework is mentioned below (Figure 1). In this research survey questionnaire was used to collect the data among textile SMEs of Pakistan. The population of respondents included owners, CEO/managing director and senior manager. Simple random sampling technique was used in this research. The list of SMEs was obtained from SMEDA (Small and Medium Enterprises Development Authority) (SMEDA, 2016). According to the registered list in the Small Medium Development Authority (SMEDA), there are 27,250 small and medium-scale textile firms (Pakistan Bureau of Statistics, 2015). Based on Krejcie and Morgan (1970), there were 379 sample required to represent the population. Therefore 379 questionnaires were distributed in Textile SMEs out of which 350 were returned and usable. There are three variables involved in this research study namely; firm performance, intellectual capital and environmental turbulence. Firm performance measure is adopted from Wiklund and Shepherd (2003) which consist of 10 items. The intellectual was measured by 14 items: human capital (5 items), organizational capital (4 items) and social capital (5 items) which were adopted from (Subramaniam and Youndt, 2005). The environmental turbulence scale is adopted by Jaworski and Kohli (1993), which will be measured by 15 items: market turbulence (5 items), technological turbulence (4 items), and competitive intensity (6 items). Answers were elicited on a 7-point Likert scale ranging from 7=“strongest agree” to 1=“strongly disagree”. Before preceding the collection of complete data, a pilot study was conducted. The questionnaire was distributed among 50 respondents but got the valid response from 35 respondents. The reliability coefficient of Cronbach’s alpha was used to assess the consistency of the scale. All the variables meet the threshold valve of Cronbach’s alpha (i.e., 0.7). The Cronbach’s alpha value of firm performance, intellectual capital and environmental turbulence are 0.92, 0.899 and 0.90.
he study used Structural Equation Modeling (SEM) and applies Partial Least Squares (PLS) using Smart PLS 3.2.7 to assess the Measurement model and structural model. The first step in this study focuses on construct reliability and validity (Measurement Model), whereas the second step tests structural relationships among latent constructs (Structural Model). There were 350 (92%) respondents, out of 379 respondents who finally made it to analysis, are CEOs/managing directors in their respected organizations while 32 (9%) of them are senior managers. Although 315 (90%) of the respondents are male, 35 (10%) of them are female. In addition, married among the respondents constitute 82%, representing 287 respondents, of the entire sampled respondents while singles constitute 18% (63 respondents). Majority of the respondents (53%) are between 31-40 years of age. This is followed by the fact that 101 of them (29%) are within the 41-50 age bracket. While 42 of the respondents (12%) fall between 20-30 years of age bracket, only 21 (6%) are above 50 years of age. Primarily data analysis is conducted to meet the assumption of running the PLS-SEM. After that measurement model and structural model are assessed by PLS-SEM. Measurement model is use to assess the reliability and validity of the constructs (Hair et al., 2010). The model is Reflective-Reflective and the constructs are higher-order. Repetitive indicator approach is used to assess the model (Becker et al., 2012). For indicator reliability, Cronbach Alpha and Composite Reliability (CR) were evaluated and for Validity, convergent validity (AVE) and discriminant validity were examined. The results from this study revealed that Composite-Reliability (CR) values are 0.941 (Environmental Turbulence), 0.944 (Intellectual Capital) and 0.935 (Firm Performance) as shown in Table 1. The Cronbach Alpha values are 0.933 (Environmental Turbulence), 0.936 (Intellectual Capital) and 0.923 (Firm Performance) as shown in Table 1 and Figure 2. Convergent-validity is assessed by AVE which values are 0.516 (Environmental Turbulence), 0.547 (Intellectual Capital) and 0.592 (Firm Performance) as shown in Table 1. Discriminant validity for this model is measured by Fornell-Larcker Criterion (Hair et al., 2010) as shown in Table 2. It indicates that the square root of AVE (diagonal) is higher than the correlations (off-diagonal) for all reflective constructs. Once the reliability and validity is achieved in measurement model, after that we assess the structural model. In structural model we examined the Coefficient of determination (R2 value), effect size (ƒ2) and path coefficient (Hypothesis testing). The Coefficient of determination (R2 value) of this study is 38.6%. It means that IC and ENTUB explained the 36.6% variance of endogenous variable i.e. firm performance as shown in above Figure 1. According to Table 3, the endogenous variable (SME performance) was explained by intellectual capital and environmental turbulence with effect sizeƒ2) of 0.281 and 0.066 respectively, and thus indicating medium and small effect size of the two respective exogenous variables. Note: 0.02, 0.15 and 0.35 stand for small, medium and large. 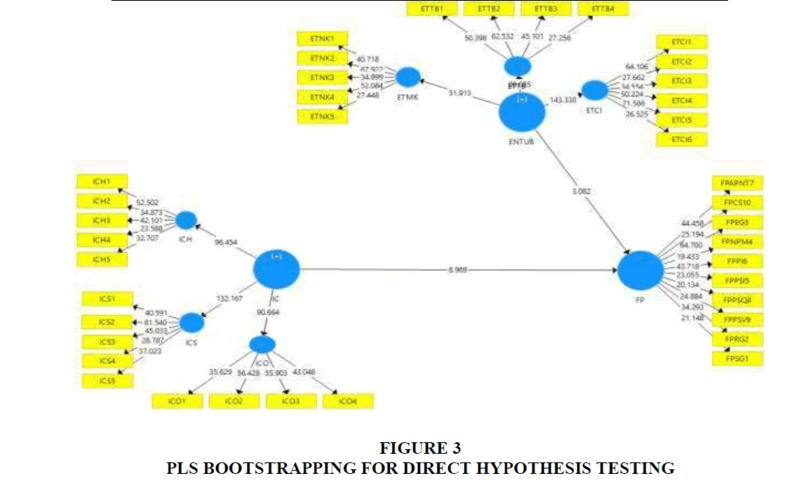 For evaluating the path coefficient (hypothesis testing), we run the bootstrapping in Smart-PLS. two-tailed test with 1% level of significance to assess the P-value and T-statistics to test the significance or insignificance of hypothesis. Table 4 and Figure 2 shows that Intellectual capital has a significant effect on endogenous variable (firm performance) (β=0.496, t=8.969, p<0.01), therefore H1 is supported. Note: ICH=Intellectual Capital (Human Capital); ICS=Intellectual Capital (Social Capital); ICO=Intellectual Capital (Organizational Capital); ETMK=Environmental Turbulence (Market Turbulence); ETCI=Environmental Turbulence (Competitive Intensity); ETTB=Environmental Turbulence (Technological Turbulence) and FP=SME performance. This study empirically validated that the intellectual capital has a significant effect on SMEs performance. Current study revealed that intellectual capital plays the vital role in the enhancement of firm performance. Textile sector is lacking behind because of skilled and experienced workers (Isa et al., 2011). Hence intellectual capital building is crucial for the sustainbale growth of Textile sector. This study is one of the piror study which addresses the importance of Intellectual capital in Textile SMEs of Pakistan. This study is consistent with the previous studies among intellectual capital and firm performance (Hsu and Wang, 2012; Scafarto et al., 2016; Francesco, 2016; Sumedrea, 2013; Tsakalerou, 2015; Tsao and Hung, 2014). There are two type of resources i.e. tangible and intangible. Now a days the firms which more focus on intangible resources are more successful. Hence Intellectual capital is also one of the intangible resource, therefore SMEs has to more focus on it for better performance. This proposed research framework further posits that environmental turbulence moderates the relationship between Intellectual capital and firm performance (Hery Pratono and Mahmood, 2014; Juma and McGee, 2006). As already mention that in Pakistan turbulent environment is the main hurdle that hindering the performance of the firms and prevent them from taking advantage of opportunities (Harram and Fozia, 2015). Pakistan is Agro-based economy and textile is the biggest sector contributing in GDP but the Environmental is uncertain, therefore the sector is not progressing in the right way. SMEs must have to focus on the environmental changes in the surrounding and then reconfigure its resources according to the environment. The firms which keep on monitoring the environmental turbulence are performing better and gain competitive advantage over their competitor. This study focused on the manufacturing textile SMEs of developing country i.e. Pakistan, mostly the previous studies more focus in developed economies, therefore this research empirically addressed the research gap and contributed in the literature as well. This study contributes significantly to the practitioners as the findings of this study provide them a clear understanding on the factors affecting the Textile SMEs performance in Pakistan, which is in line with the country’s vision 2025. With certain evidence on the factors influencing the SMEs performance, the practitioners realize the importance of the drivers for better performances. This study also hopes to help policy-makers, governmental agencies and industrial SMEs to gain better understanding related to SMEs’ problems in their endeavor to compete and survive in a competitive environment. A review of prior literature indicates that intellectual capital has a significant effect on the SMEs performance. This research framework further posits that environmental turbulence moderates the relationship between intellectual capital and performance of SMEs. The findings of this study helps SMEDA (Small and Medium enterprises Development Authority) of Pakistan in developing the guidelines and policies related to the SMEs. The findings of this research helps the Academia and practitioners the importance of intellectual capital and environmental turbulence. Mostly the research studies on these variables are conducted in developed economies and among large firms, hence more studies are required among SMEs. The direction for future research should be to empirically test to what extent and how intellectual capital and environmental turbulence are related and impacting other sectors of SMEs performance in the emerging economy like Pakistan. This study is a cross-sectional study. A longitudinal methodology might be necessary to validate this study in future. Arnaout, B., & Esposito, M. (2018). The value of communication in turbulent environments: How SMEs manage change successfully in unstable surroundings. International Journal of Entrepreneurship and Small Business, 34(4), 500-515. Ansoff, H.I. (2007). Strategic management. Journal of Management Research, 5. Becker, J.M., Klein, K., & Wetzels, M. (2012). Hierarchical latent variable models in PLS-SEM: Guidelines for using reflective-formative type models. Long Range Planning, 45(6), 359-394. Bemby S., Mukhtaruddin, B.., Hakiki, A., & Ferdianti, R. (2015). Intellectual capital, firm value and ownership structure as moderating variable: Empirical study on banking listed in Indonesia stock exchange period 2009-2012. Asian Social Science, 11(16), 148-159. Bilal, A.R., Khan, A.A., & Akoorie, M.E.M. (2016). Constraints to growth: A cross country analysis of Chinese, Indian and Pakistani SMEs. Chinese Management Studies, 10(2), 365. Bogner, W.C., Thomas, H., & McGee, J. (1999). Competence and competitive advantage: Towards a dynamic model. British Journal of Management, 10(4), 275-290. Bontis, N. (1998). Intellectual capital? : An exploratory study that develops measures and models. Management Decision, 36(2), 63-76. Bontis N., Keow, W.C.C., & Richardson, S. (2000). IC in Malaysian industries intellectual capital and business performance in Malaysian industries. Journal of Intellectual Capital, 1(1), 85-100. Boyne, G.A., & Meier, K.J. (2009). Environmental turbulence, organizational stability, and public service performance. Administration & Society, 40(8), 799-824. Camillus, J.C. (1982). Reconciling logical incrementalism and synoptic formalism: An integrated approach to designing strategic planning processes. Strategic Management Journal, 3(3), 277-283. Chaharbaghi, K., & Lynch, R. (1999). Sustainable competitive advantage: Towards a dynamic resource-based strategy. Management Decision, 37(1), 45-50. Crema, M., & Verbano, C. (2014). Managing intellectual capital in Italian manufacturing SMEs. Creativity and Innovation Management, 1-14. Delgado-Verde, M., Martín-de Castro, G., & Emilio Navas-López, J. (2011). Organizational knowledge assets and innovation capability. Journal of Intellectual Capital, 12(1), 5-19. Dundon, T., & Wilkinson, A. (2018). HRM in small and mediumsized enterprises (SMEs). In Human Resource Management. Routledge. Edvinsson, L., & Sullivan, P. (1996). Developing a model for managing intellectual capital. European Management Journal, 14(4), 356-364. Emmanuel, A., Nnorom, G., & Kwarbai, J. (2016). Intellectual capital and performance sustainability of SMEs in Lagos. International Journal of Advanced Studies in Business Strategies and Management, 4(1), 77-88. Federico, J., Rabetino, R. & Kantis, H. (2012). Comparing young SMEs & apos: Growth determinants across regions. Journal of Small Business and Enterprise Development, 19(4), 575-588. Gho, P.C. (2005). Intellectual capital performance of commercial banks in Malaysia. Journal of Intellectual Capital, 6(3), 385-396. Gill, A., & Biger, N. (2012). Factors that affect small business performance in Canada. International Journal of Entrepreneurial Venturing, 4(2), 181. Hair, J.F.J., Hult, G.T.M., Ringle, C., & Sarstedt, M. (2016). A primer on partial least squares structural equation modeling (PLS-SEM). Harram, A., & Fozia, M. (2015). Customer Oriented marketing capabilities and firm performance mediated by new product development capabilities and moderated by environmental. International Journal of Economics & Management Sciences, 4(9). Hery Pratono, A., & Mahmood, R. (2014). The moderating effect of environmental turbulence in the relationship between entrepreneurial management and firm performance. Universal Journal of Management, 2(7), 285-292. Hsu, L.C., & Wang, C.H. (2012). Clarifying the effect of intellectual capital on performance: The mediating role of dynamic capability. British Journal of Management, 23(2), 179-205. Hughes, P., Hodgkinson, I.R., Hughes, M., & Arshad, D. (2017). Explaining the entrepreneurial orientation-performance relationship in emerging economies: The intermediate roles of absorptive capacity and improvisation. Asia Pacific Journal of Management, 1-29. Irfan, S.M., Kee, D.M.H., Qureshi, R.W., & Hussain, R. (2014). Measuring performance of SMEs in Pakistan using Pls-SEM: Evaluating MBNQA criteria as TQM Framework. Science International, 26(4), 1707-1718. Jardon, C.M., & Susana Martos, M. (2012). Intellectual capital as competitive advantage in emerging clusters in Latin America. Journal of Intellectual Capital, 13(4), 462-481. Jaworski, B.J., & Kohli, A.K. (1993). Market orientation: Antecedents and Consequences. Journal of Marketing, 57, 53-70. Jo, H., & Lee, J. (1996). The relationship between an entrepreneur’s background and performance in a new venture. Technovation, 16(4), 161-211. Juma, N., & McGee, J.E. (2006). The relationship between intellectual capital and new venture performance: An empirical investigation of the moderating role of the environment. International Journal of Innovation and Technology Management, 3(4), 379-405. Kamath, G.B. (2007). The intellectual capital performance of the Indian banking sector. Journal of Intellectual Capital, 4(1), 84-99. Kamukama, N. (2013). Intellectual capital: Company’s invisible source of competitive advantage. Competitiveness Review, 23(3), 260-283. Khalique, M., Bontis, N., Shaari, J.A.N., & Isa, A.H.M. (2015). Intellectual capital in Pakistani small and medium enterprises. Journal of Intellectual Capital, 16(1), 224-238. Khalique, M., Bontis, N., Bin Shaari, J.A.N., Yaacob, M.R., & Ngah, R. (2018). Intellectual capital and organisational performance in Malaysian knowledge-intensive SMEs. International Journal of Learning and Intellectual Capital, 15(1), 20-36. Khalique, M., Shaari, J.A.N., Isa, A.H.M., & Ageel, A. (2011). Role of intellectual capital on the organizational performance of electrical and electronic SMEs in Pakistan. International Journal of Business and Management, 6(9), 253-d257. Kipley, D.H., & Lewis, A.O. (2009). The Scalability of H. Igor Ansoff ’s strategic management principles for small and medium sized firms. Journal of Management Research, 1(1), 1-26. Lee, S.P., & Mohammed, S. (2014). Intellectual capital on listed agricultural firms’ performance in Malaysia. International Journal of Learning and Intellectual Capital, 11(3), 202. Littunen, H., & Niittykangas, H. (2010). The rapid growth of young firms during various stages of entrepreneurship. Journal of Small Business and Enterprise Development, 17(1), 8-31. Martín-de Castro, G., Delgado-Verde, M., Navas-López, J.E., & Cruz-González, J. (2013). The moderating role of innovation culture in the relationship between knowledge assets and product innovation. Technological Forecasting and Social Change, 80(2), 351-363. Mbonyane, B., & Ladzani, W. (2011). Factors that hinder the growth of small businesses in South African townships. European Business Review, 23(6), 550-560. Meier, K.J., & O’Toole, L.J. (2011). Comparing public and private management: Theoretical Expectations. Journal of Public Administration Research and Theory, 21(3), 283-299. Mills, J., Platts, K., & Bourne, M. (2003). Applying resource-based theory. International Journal of Operations & Production Management, 23(2), 148-166. Nijssen, E.J., Hillebrand, B., Vermeulen, P.A.M., & Kemp, R.G.M. (2006). Exploring product and service innovation similarities and differences. International Journal of Research in Marketing, 23(3), 241-251. O’Toole, L.J., & Meier, K.J. (1999). Modeling the Impact of Public Management: Implications of structural context. Journal of Public Administration Research and Theory, 9(4), 505-526. Ozkan, N., Cakan, S., & Kayacan, M. (2016). Intellectual capital and financial performance: A study of the Turkish banking sector. Borsa Istanbul Review. Radulovich, L., Javalgi, R.R.G., & Scherer, R.F. (2018). Intangible resources influencing the international performance of professional service SMEs in an emerging market: Evidence from India. International Marketing Review, 35(1), 113-135. Ridhuan, M. (2015). SMEs performance? : Does intellectual capital. International Journal of Administration and Governance, 1(3), 5-10. Roos, G., & Roos, J. (1997). Measuring your company’s intellectual performance. Long Range Planning, 30(3), 413-426. Sambasivan, M., Abdul, M., & Yusop, Y. (2009). Impact of personal qualities and management skills of entrepreneurs on venture performance in Malaysia: Opportunity recognition skills as a mediating factor. Technovation, 29(11), 798-805. Scafarto, V., Ricci, F., & Scafarto, F. (2016). Intellectual capital and firm performance in the global agribusiness industry: The moderating role of human capital. Journal of Intellectual Capital, 17(3), 530-552. Shumaila, J., & Afza, T. (2014). Relationship between intellectual capital and financial performance of Pakistan non-financial firms and a comparative study of textile and chemical industry. Vindyabharati International Interdisciplianry Research Journal, 3(1), 67-80. SMEDA. (2016). Compliance with international standards. St-Pierre, J., & Audet, J. (2011). Intangible assets and performance. Journal of Intellectual Capital, 12(2), 202-223. Subramaniam, M., & Youndt, M.A. (2005). The influence of intellectual capital on the types of innovative capabilities. Academy of Management Journal. Sumedrea, S. (2013). Intellectual capital and firm performance: A dynamic relationship in crisis time. Procedia Economics and Finance, 6(13), 137-144. Tarus, D.K., & Sitienei, E.K. (2015). Intellectual capital and innovativeness in software development firms: The moderating role of firm size. Journal of African Business, 16(2), 48-65. Tiong, Y.Y., Sondoh Jr, S.L., Igau, O.A.E., & Tanakinjal, G.H. (2017). Green employee empowerment and green physical evidence: The green service strategy to enhance firm performance. Asian Journal of Business Research, 7(2), 94. Tsakalerou, M. (2015). A meta-study of intellectual capital and firm performance: When the whole is more than the sum of its parts Mariza Tsakalerou. International Journal of Intellectual Capital, 12(3), 287-299. Tsao, H.H., & Hung, Y.C. (2014). Intellectual capital and performance in banking industry of Taiwan. International Journal of Innovation and Learning, 16(1), 34-52. Ullah, B., Aziz, A., & Yousaf, M.H. (2015). IC in SMEs in Pakistan. Global Journal of Management and Business Research, 15(11), 41-48. Yasuda, T. (2005). Firm growth, size, age and behavior in Japanese manufacturing. Small Business Economics, 24(1), 1-15.